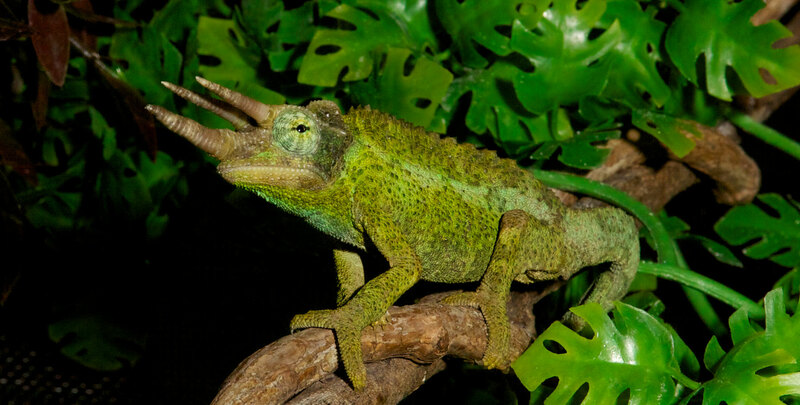 Jackson’s Chameleon | Zoo Med Laboratories, Inc.
Distribution: Kenya & Tanzania, Africa. Jackson’s Chameleons have long been among the most popular chameleon species kept as pets. This is a small, beautiful species of chameleon that has fascinating behaviors and requires more moderate temperatures than most species. Chameleons require daily care and are considered higher maintenance than many other reptiles. Jackson’s chameleons are a good choice for beginning chameleon hobbyists, yet are challenging for a beginning reptile keeper. Captive bred Jackson’s Chameleons are readily available and are always recommended over wild caught animals. Zoo Med’s REPTIBREEZE® Open Air Screen Cages are the perfect match for Jackson’s Chameleons. Young chameleons can be kept together in a glass Naturalistic Terrarium®, but should be housed separately once they are eating well and are established. Be sure that any live plants being used are non-toxic because Chameleons will occasionally eat plants. Ficus Trees are a good choice for Jackson’s Chameleons. Chameleons prefer a nighttime drop in temperature. We recommend a low wattage heat bulb such as a Nightlight Red™ or Nocturnal Infrared Heat Lamp. The ReptiTemp™ 500R Thermostat or Hygrotherm™ can be used to regulate temperatures or control heating elements. Zoo Med’s ReptiSun® 5.0 Linear or Compact Fluorescent Lamps are a great choice for providing chameleons with UVB. The PowerSun® is an excellent way to provide both UVB and Heat all in one lamp! Allowing your chameleon to bask in the sun whenever possible is always strongly recommended. It is strongly recommended that young chameleons are not kept on any type of loose substrate. Eco Carpet™ is the safest and cleanest choice for young chameleons. Jackson’s Chameleons are insectivorous animals and will require a varied diet of insects. Zoo Med’s ReptiCalcium® and ReptiVite™ with Vitamin D₃ should be added to food as directed. Calcium and multi-vitamins are critical to keeping your growing chameleon healthy and active. Zoo Med’s Can O’ Insects makes offering a variety of feeders easy! Always provide a shallow dish of fresh water and add ReptiSafe® Water Conditioner to your tap water to remove Chlorine and Chloramines. Most chameleons prefer to drink or lap water from leaves. This can be replicated in captivity by offering a drip system or a misting system. Zoo Med offers several products that will allow you to provide your chameleon with drinking water. The Big Dripper™ will allow you to drip water onto leaves from above the cage. The MotoMister™ makes daily spraying a bit easier. The Habba Mist® will provide a scheduled misting of your terrarium. Did you know Jackson’s Chameleons are viviparous? This means that they give birth to live young, instead of laying eggs like most chameleons. Always remove baby Jackson’s Chameleons immediately from the parent’s enclosure, they will eat their own babies!